We have been on a spiritual journey to explore the significance of Jesus' declaration in John 8:12 that "I am the Light of the World" and His teaching to His new disciples in Matthew 5:14 that "You are the light of the world." Furthermore 1 John 1:5 declares that "God is light." We are seeking to understand these statements in terms of our relationship with the Lord, each other, the world and what are the everyday, practical ways that the power of the Light works in our life. The Bible opens with the command "Let there be light," and ends with a description of New Jerusalem where the Lord himself provides the light for the city. It is hard to imagine that man lived for so many centuries without an understanding of how to utilize the power of electricity and the rapid advance of technology over the past 100 years should make each of us reflect on the vast changes that are headed our way in the next few years. The Lord has impressed upon me to be a voice focused on the power of the light. Light power is dramatically changing the way we live over the past thirty years through fiber-optics for telephone and cable communications, CD's to replace albums, DVD's to replace videotapes, lasers to fix our eyesight and lasers for other surgical procedures. The race is on now for those who will understand how to harness the power of the light. "Did you know that in 15 minutes the sun radiates as much energy as mankind consumes in all forms, during an entire year? Did you know that in one day the sun radiates enough energy on the United States to power the entire nation for a year and a half? Not only that, but it does it every day - for free. Solar power is a safe, clean and renewable energy resource that will no doubt play a vital role in powering our future." Solar power is clean for the environment, simple to understand and install and is becoming more affordable every day. It can become the game changer for supplying power in impoverished countries all over Africa, Haiti and the third world. Because of the spiritual connection between God and light I believe solar technology represents a unique opportunity for the church to take a leadership role in exploring and utilizing the power of the sun. Let's take the lead in installing solar on our churches and homes and inspiring our young people to become the innovators of this technology. Those who have mastered the art of extracting power from beneath the surface have dominated the world financially and politically and now threaten to destroy our environment. Distributed solar power can change the balance of power around the world and in our communities while helping to preserve our world for future generations. Seven years ago, Mike Moore, who had spent his career repairing cars, decided he would like to own an electric car. So he decided he would convert a regular, gasoline-powered vehicle to electric power. How to go about it? "It was tough," he says. "Almost impossible to find reliable information on the conversion process." But he proceeded, learning as he went along. And he learned one major lesson: Hey, this really isn't that hard. So Moore and his wife, Paula, founded a small company called Ampmobile Conversions, based in their hometown of Wylie, S.C. And while most of Moore's time is spent converting cars to electric power in his shop, several years ago he took his act on the road, offering three-day seminars to small groups who want to learn how to do the conversions on their own. Which is why Moore spent three days last week at the Maximum Life Church in Orlando, where Bishop Carroll R. Johnson and his wife, Pastor Muriel Johnson, hosted Moore's seminar for several of their congregation members. "During the first oil embargo," Bishop Johnson says, "I got interested in solar power." He subsequently made several trips to Africa and quickly realized how important solar energy — and, as an extension, electric-powered vehicles — could be. "Last summer, I started doing a series of messages — 'Jesus is the light of the world,' and the first command in the Bible is, 'Let there be light' — and I was really exploring what that means. Couple that with the African theme," he says, "and I look at electric cars being a stepping stone to solar-car technology, things like thin-film solar that could be applied to the exterior of the car. And someday all that will be ready. But as an interim step, I thought we could look at developing electric cars, from a neighborhood level. "The church has typically been behind any kind of technology curve — it's often like, 'What's going on?' — and by the time they find out, the next new technology is here." So when Bishop Johnson learned that implementing solar technology, and even converting cars to electricity, wasn't that complicated, "I thought it was time to get some training going." 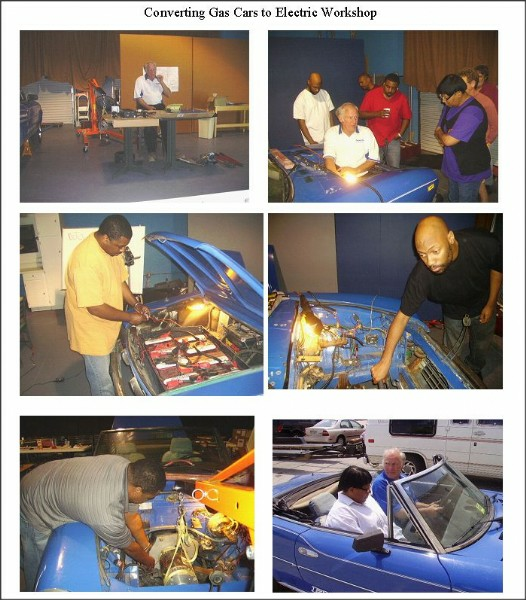 So he and his wife pitched in with the hands-on portion of Mike Moore's three-day seminar, in which Moore and his students disassembled a blue Fiat 124 convertible sports car that Moore had already converted to electric power. They then inspected all the bits and pieces and re-assembled it, all the while getting advice from Moore on how to do it themselves, from scratch. This week, they will likely do that, converting a Ford Probe with a bad gas engine to one that runs on electric power. Moore won't be here, "But I'm just a phone call away," he told the class. So what's involved? Obviously, pulling out the gas-powered engine and most anything related to it — fuel lines, gas tank, radiator — and preparing the engine bay to accept an electric motor. The round motor isn't that large — maybe as long as a loaf of bread, but bigger around and quite heavy — but it has plenty of power to propel the car. Moore had demonstrated how to mate the engine to the little Fiat's manual transmission, and he addressed the assembly and placement of the battery pack. Sure, it would be nice to use the latest-and-greatest battery technology that the new-car manufacturers have access to, but that would put the conversion cost far out of reach of most people. So the Fiat is powered by nine big conventional batteries, the kind used to power golf carts or other electric vehicles. Moore has mounted three batteries in the front, six in the trunk, plus one more small, regular 12-volt car battery to power lights and accessories. At first, it all seems so foreign, then it gradually begins to sink in. And yes, as Moore tells us over and over, "It really isn't that complicated. If you can read a road map, you can read a wiring diagram, and that's a road map that shows you all you need to know." So, the questions you want answered: How often do these batteries need to be replaced? "Maybe every four to six years," Moore says. "Other than that, the maintenance is minimal." Average conversion cost to convert a car like this Fiat? "About $15,000 if I did it for you. If you do it yourself, $10,000 to $11,000." Average range? "Thirty to sixty miles, depending on driving conditions," Moore says. Recharge time? "Overnight, easily." On 110 or 220 volts? "Either one, preferably 220." Can I recharge on the road? "Sure. Just ask somebody if you can plug in for an hour's worth of electricity, and it'll add a lot to your range." In attendance at the recent session was Larry Wexler, Orlando's leading proponent of electric cars, who built his own solar-powered vehicle, the XLR8 Sun, which he displays often at car shows. Both Wexler and Moore agree there has been a decline in interest in electric cars, traceable to the economy, but they also think it's likely we are only one oil embargo away from the public rediscovering electric-powered vehicles. If you don't want to wait that long, you can learn more about Mike Moore's company at Ampmobiles.com; about Larry Wexler's solar car at XLR8Sun.com; and about Bishop Johnson's church — and yes, he does plan to host more seminars — at maximumlifechurch.com. Sentinel Automotive Editor Steven Cole Smith can be reached at scsmith@orlandosentinel.com. ©2016 LifeVision.Church - All Rights Reserved.